CCTV for Security Professionals provides the information necessary to design the ideal CCTV system. The chapters are stand-alone sources of information on their subjects and are presented in logical sequence to guide the reader from basic principles to more complex for a complete system understanding. 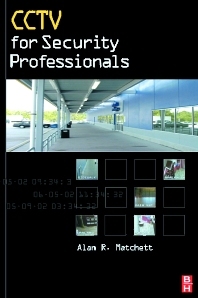 In his straight-forward and informative text, Alan Matchett approaches the camera systems from the user's point of view, providing the security manager with the knowledge to discuss the system, its desired features, and the areas of design concern within the context of an organization's business model. This can prove to be invaluable when evaluating an existing system, the use and components of a given system, or in evaluating a system design proposed by a vendor. Installers and service personnel will benefit from the functions and possibilities that are available with the various components and by gaining an understanding of their customers' needs. Newer technicians will learn how to set up the system properly, and can familiarize themselves with the technologies that go into a CCTV system. Security equipment sales personnel will also gain a better knowledge of the customer's needs as well as learn to determine exactly what questions they should be asking the customer and what the customer's responses mean. In this manner, the book will offer invaluable tips to ensure customers get exactly what they expect in a system. Provides a detailed explanation of CCTV components and the technology behind analog and digital CCTV systems. Establishes a "common language" for security professionals, CCTV system designers and sales personnel to use as a basis for system design. Provides a clear explanation of the design process and design principles. Security managers, security dealers, security consultants, CCTV resellers, system and product developers, sales staff, system dealers and distributors. Johnson Controls Inc. in Milwaukee, Wisconsin. With over 24 years of experience, Mr. Matchett has worked in a wide variety of environments and has established himself as a leading authority in CCTV, Access Control, Electronic and Physical Security. Since 1988, he has performed security work in over 80 countries throughout the world. Mr. Matchett has also performed design, analysis, installation, repairs and Project Management for residential, industrial, office environment, retail, military, foreign and U.S. government, Nuclear, educational, healthcare, telecommunication, hotel and lodging, and food service customers. Mr. Matchett has a B.A. in Creative Writing and a B.S. in Electronic Engineering Technology. He has been a Certified Protection Professional since 1993 and is frequently called upon for speaking engagements internationally. He has written numerous articles for Security publications, newspapers and magazines.